Buy MJPM quality...our coins are hand-picked! MJPM Four Coin Saint Gaudens & Indian Head U.S. Gold Type Set. Our pre 1933 U.S. Gold type set is a four coin set containing the $20 Saint Gaudens, $10 Indian, $5 Indian, and the $2-1/2 Indian gold coins in choice brilliant ALMOST UNCIRCULATED (AU55 - AU58) condition. This popular coin set comes housed in a handsome Capitol Plastics hard case making a very impressive display of your early American gold coins! MJPM Four Coin Liberty Head U.S. Gold Type Set. Our pre 1933 U.S. Liberty Gold Coin type set is a four coin set containing an example of the U.S. $20 dollar, $10 dollar, $5 dollar, and $2-1/2 dollar Liberty gold coins in choice brilliant ALMOST UNCIRCULATED (AU55 - AU58) condition. 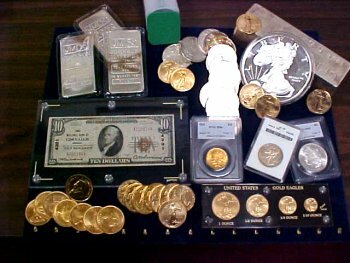 The set comes housed in a handsome Capitol Plastics hard case making a very impressive display of your early American gold coins! MJPM Eight Coin U.S. Saint Gaudens, Indian & Liberty Gold Type set. This awesome set contains an example of the $2-1/2, $5, and $10 Indian Head coins, the $2-1/2, $5, and $10 from the Liberty Head series and both Liberty Head and Saint Gaudens $20 dollar gold double eagles in choice brilliant ALMOST UNCIRCULATED (AU55 - AU58) condition. Each set comes housed in a handsome Capitol Plastics hard case making a very impressive display of your early American gold coins!